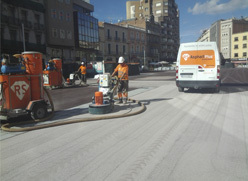 After years of R & D, both in its facilities and on site, RS Technology has created a new type of high performance flooring, RS AsphaltPlus, the first and only global solution developed for the treatment and grinding asphalt. Prestigious architectural firms as Herzog & de Meuron have included this new flooring in the most avant-garde projects. 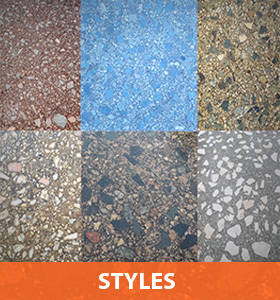 RS Asphaltplus provides a spectacular finish, highly decorative, with a duration of up to twice the stamped concrete and much higher than that of the limestone tiles, with cost savings ranging between 40 and 75 % due to rapid polished tarmac procedure, minimizing discomfort and injury. 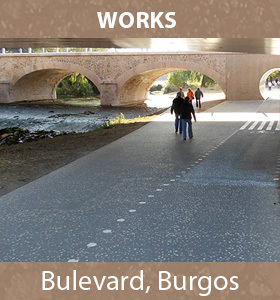 It also finishes achieve optimal pavement repairs thereof, recycling 100% of raised materials (water facilities, electricity, gas). Its innovative technology has been designed with the highest level of environmental sustainability. 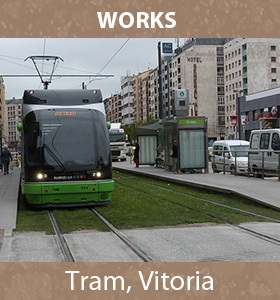 The application procedure takes advantage of the ecological advantages of asphalt, a byproduct of oil refining without generating any waste. Its advanced thermoplastic composition provides for more flexibility and impermeability preventing premature cracking. Depending on the various power finishing treatments also slip resistance. 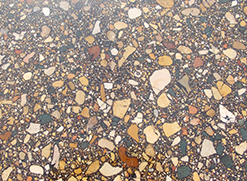 On the other hand, offers an infinite range of finishes, to vary the amount and size of the aggregates and bitumen - colored allowing aesthetically personalized projects. 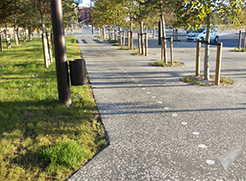 RS AsphatPlus is ideal for sidewalks, avenues, boulevards, plazas, sports facilities, bike lanes, streetcar tracks and parks, among other places. RS AsphaltPlus is a highly durable joint-free mineral paving, which lasts twice as long, without maintenance, as concrete or paving stones. 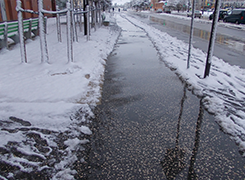 It lasts longer, and supports loads better than other materials, because of the plasticity of the asphalt and because it has no joints through which water and chemical agents (such as the salt often spread in winter) can filter. 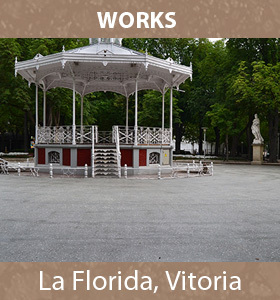 This material gives excellent results, with low repair and maintenance costs. 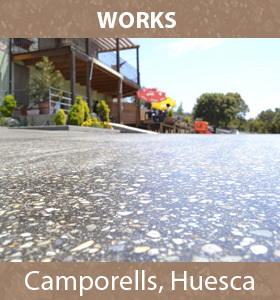 This asphalt not only provides a smooth and continuous surface, but our exclusive process also makes it impermeable . Excellent waterproofing prevents water accumulating on the surface, which would cause damage and wear. 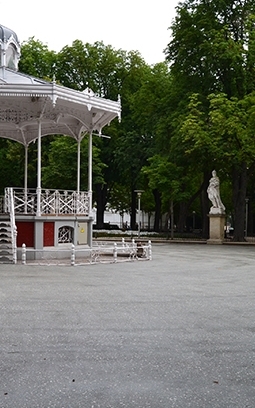 The paving maintains its original appearance for a long time. If our exclusive EndurPlus treatment is added, the result is even greater durability and stain prevention. RS AsphaltPlus polished asphalt agglomerate iscontinuous paving which is very hard-wearing due to the flexibility of its thermoplastic composition. 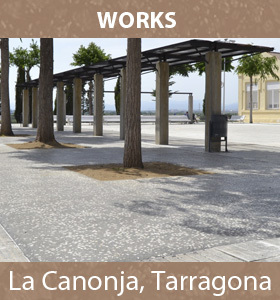 Its extraordinary flexibility is far greater than for any other paving, and as a result it can adapt to any possible deformation of the substrate and thus prevents breakage and cracking due to settling and/or expansion. 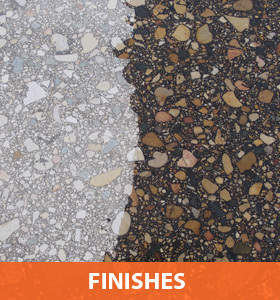 Thanks to the different compounds in the mix, the unlimited variety of possible aggregates and the wide choice of base colours, RS AsphaltPlus offers anunlimited range of designs. Each site and each project can have the personaliseddesign which is best suited to its environment. Thus, in addition to it being new and highly decorative, there is the added factor that each paving can beexclusively customised. 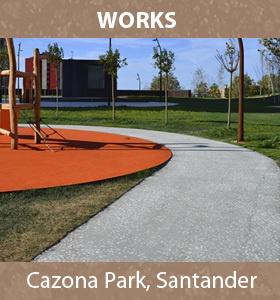 Not only is RS AsphaltPlus an attractive surface which is solid and convenient for many public spaces, but its special additives make it a safe surface. Despite its impermeability, the surface of RS AsphaltPlus is given a non-slip treatment which is often not found in other paving materials. 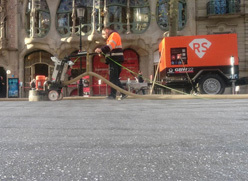 The RS AsphaltPlus process complies with the European slip resistance standards (Rd>45 class 3)currently in force, so we can guarantee that our process produces a pedestrian-safe surface. 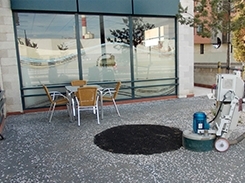 RS AsphaltPlus is a product based on ecological and recyclable raw materials. 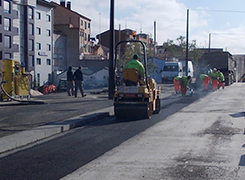 The process of asphalting and polishing generates no waste,since any surplus is recycled to make new asphalt. Additionally, its long life and easy maintenance means it does not squander natural resources. When the paving reaches the end of its useful life, it is once again recycled, so you will not see the skips full of rubble which are so much in evidence when other paving is dug up. 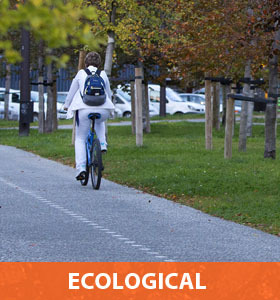 RS AsphaltPlus is more economical than other urban paving systems because, by using the resources already available for asphalting road surfaces, large pedestrian areas can be paved quickly and easily, resulting in lower costs and less disruption. 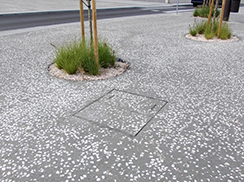 To give you some idea: the saving, when compared to printed concrete paving, can be as much as 40%; and it costs a quarter of what limestone paving stones would cost. After years of traffic, wear, stains and damage polished asphalt pavements are restored easily and quickly restoring its original appearance. 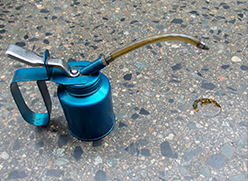 This system allows us to clean the gum stuck on polished asphalt pavements very easily and with exceptionally low costs.